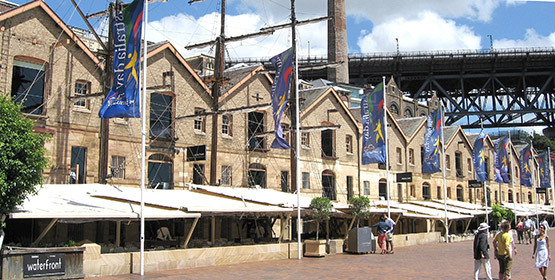 This row of former warehouses in Campbells Cove in The Rocks now houses modern restaurants that are popular with visitors, both during the day and at night. 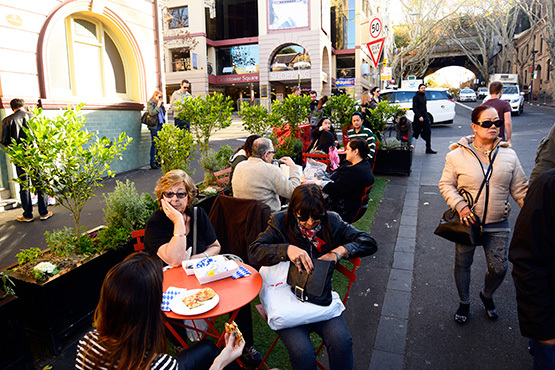 The outdoor areas have been weather-proofed for the cooler winter months. 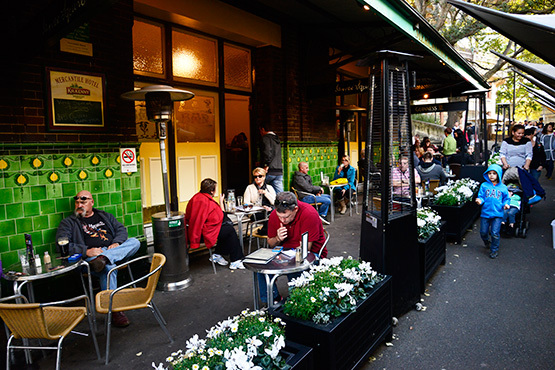 Catch a bus or train to Circular Quay. Exit in Alfred Street, walk the short distance west to George Street and turn right, and you are at the start of The Rocks district. 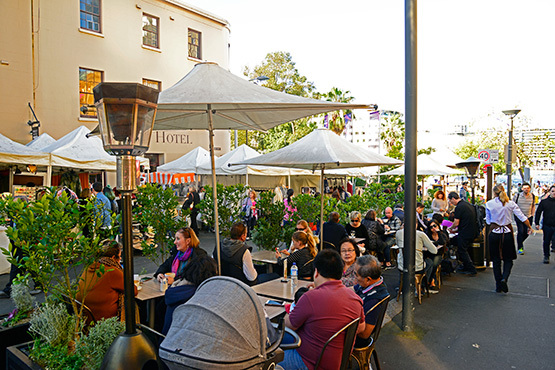 The Rocks cafe and restaurant precinct is one that caters for all tastes and all budgets, regardlesss of whether you want to eat out cheaply or splash out on fine food. 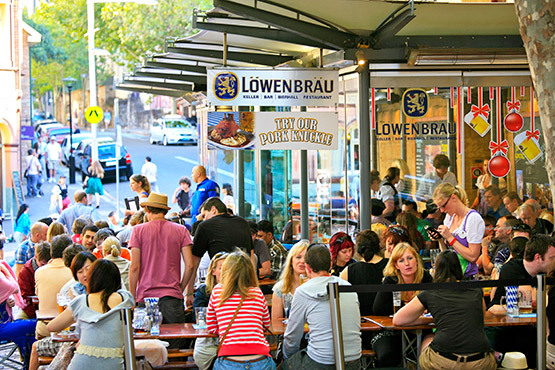 The precinct is one of Sydney's most popular for dining out, whether it be during the day or in the evening. 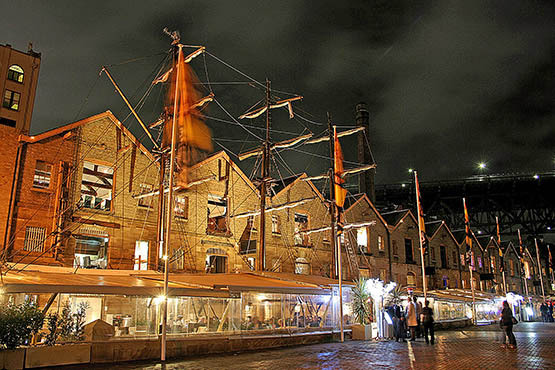 When it comes to eateries, The Rocks has two faces: the more formal and upmarket dining that takes place at Campbells Cove, where a row of former warehouses have been converted into chic restaurants with areas that look out onto Circular Quay, the harbour and the Sydney Opera House. 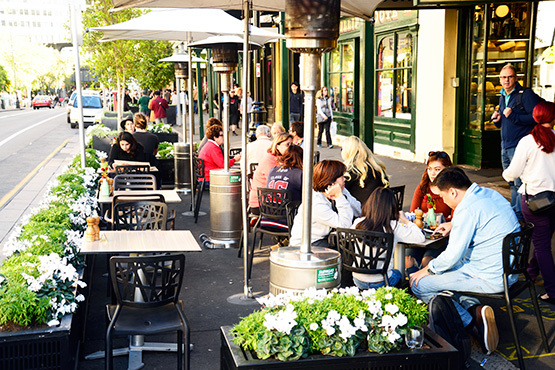 In the cooler winter months gas heaters are in place and the outdoor areas enclosed with plastic blinds, which means they can be used all year round. 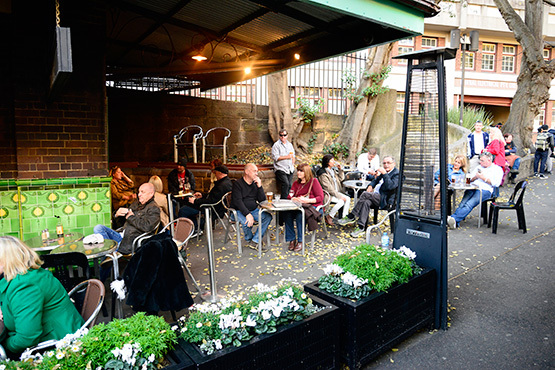 The other face of The Rocks lies in the back streets — Kendall Lane, Playfair Street, Mill Lane, Atherden Street, as well as other small lanes and passageways. 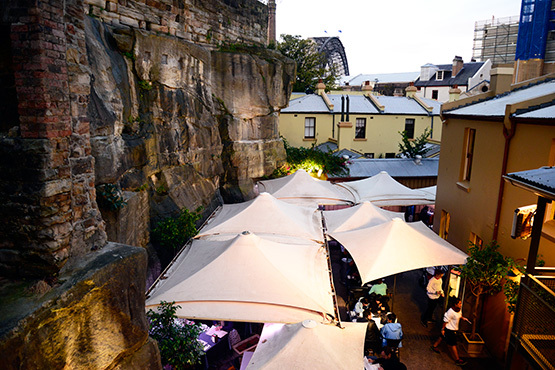 This is the most interesting part of The Rocks and much of the interest lies in choosing from the myriad of eateries scattered throughout this area. 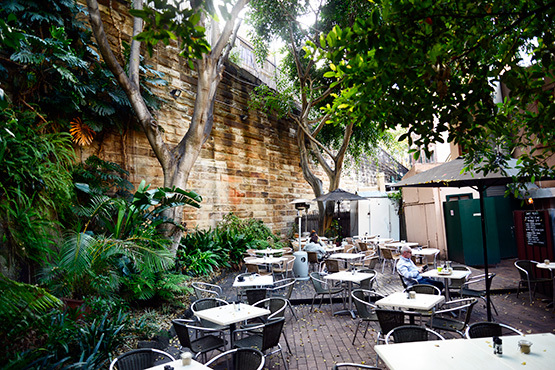 Here there are restaurants and pubs that cater for more casual dining and this is where you'll find small cafes with exquisite - almost hidden - courtyard gardens. 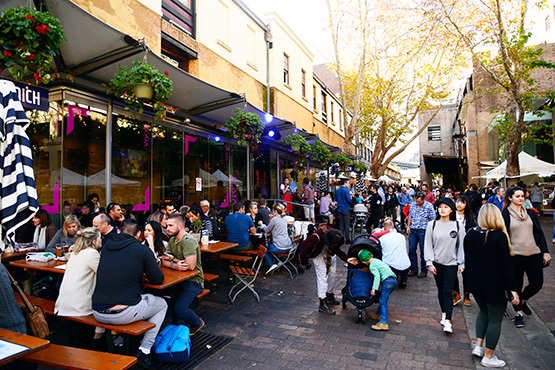 When you venture through the streets and laneways of The Rocks, if you see an opportunity to walk through to the back of a cafe or shop, make sure you grab it. 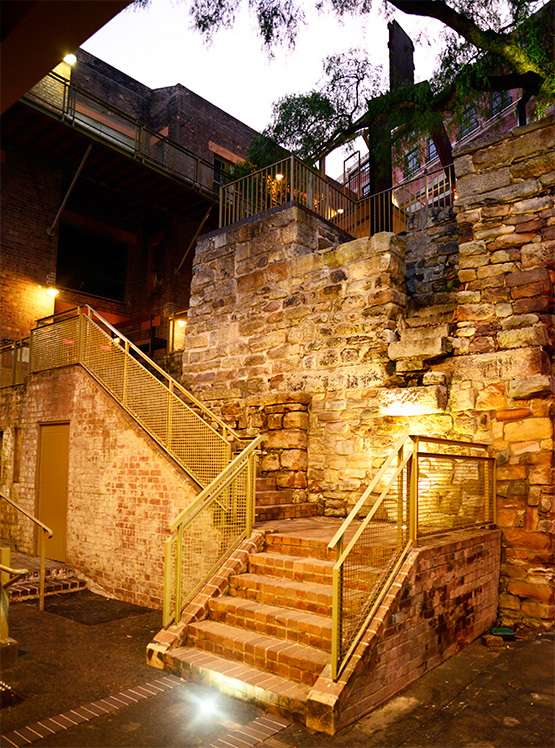 Some of the more interesting aspects of The Rocks lies hidden behind facades. One excellent example of this is Foundation Park, at the rear of the Argyle Terraces and two restaurants, Wok on Inn and Caminetto. 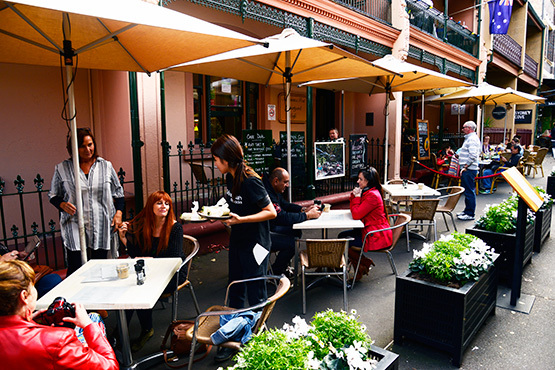 There is also quite a few restaurants and cafes in George Street, the main street running through The Rocks.